The Dri-Eaz AirWolf can be used with the WolfPack floor drying kit, or it can be used by itself to direct air into confined spaces. It is best used with some sort of ducting to blow air exactly where it is needed. 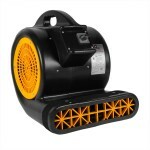 Great for removing water from hardwood floors when used with our Rescue Mat Hardwood Floor Drying System. The AirWolf is designed to run while attached to an inflation tube or ducting. The unit runs quieter, and draws less power, when attached to ducting and running under load. Never run the AirWolf with no load. Plug into a standard circuit, and turn on by throwing the one speed switch. Be certain the unit is operating correctly and safely before allowing it to run unattended. If you're interested in more blowers of this style, please take a look at our complete line of inflatable blowers. Powerful 1.0 HP motor produces up to 800 CFM & 7.75" of static pressure. Drives water from beneath damaged hardwood floors through flutes, when purchased with the Wolfpack accessory kit. Stops water from migrating by directing airflow exactly where it is needed. Can be used for other things besides drying, like inflatables. Stackable for convenient storage and transport. Rugged rotomolded housing will resist rust and corrosion. This is a review for the Water Damaged Hardwood Floor Drying Fan.